"Swear that you you will be ready to serve God, and will be prepared to give up anybody, even your father or mother, sister or brother, to the holy punishment of the Inquisition!" With his second film, Leaves from Satan's Book, Carl Theodor Dreyer leaped into the ranks of the preeminent European film directors. 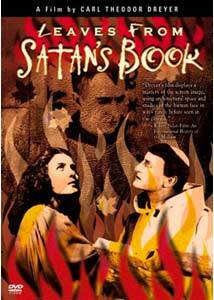 With this adaptation of The Sorrows of Satan by Marie Corelli, Dreyer makes an impassioned plea for loyalty and condemnation of treason, casting Satan as a prime mover behind several betrayals throughout history. Finding his way with his technique, Dreyer gives the somewhat tendentious material real life and emotional strength. The film is broken up into four stories, each demonstrating the hand of Satan as he moves amongst men. The first is the biblical tale of the betrayal of Jesus (Halvard Hoff) through the kiss of Judas (Jacob Texière), encouraged by the high priest, who is an embodiment of Satan (Helge Nissen). The second segment is set in Seville during the height of the Spanish Inquisition, and Satan (Nissen again) is in the role of the Grand Inquisitor. Don Gomez de Castro (Hallander Helleman) is a scientist whose daughter Isabella (Ebon Strandin) is learning from young monk Don Fernandez y Argote (Johannes Meyer). But the monk becomes obsessed with Isabella and is determined to have her for his own. When he is rejected soundly, he finds recourse by joining the Inquisition. His first assignment: the trial and execution of Don Gomez and Isabella. The third and longest segment is set during 1793 at the height of the Reign of Terror. Roving parties of executioners target the Count de Chambord (Viggo Wiehe), who has his servant Joseph (Elith Pio) promise to care for his wife, the Countess (Emma Wiehe) and daughter Geneviève (Jeanne Tramcourt). But Joseph soon falls in with Satan, in the guise of worker Erneste Durand (Nissen), and becomes a revolutionary faced with a moral quandary: betrayal of his promise or of his comrades. The final segment is set in 1918, in the Russo-Finnish war as the Reds and Whites did battle. Paavo (Carlo Wieth) and his wife Siri (Clara Wieth Pontoppidan) operate the telegraph office that is the focal point of both forces at the little town of Hirola. Paavo's friend Rautamiemi (Carl Hildebrandt) demands that Siri give in to his desires, or he will turn Paavo over to the Reds. Satan this time is the Russian monk Ivan (Nissen once more), a Rasputin-like figure determined to have bloodshed. The comparisons with Griffith's Intolerance (1916) are obvious: a union of four disparate stories with a common thread, including the Passion of Jesus, one story set in old France and one in the modern day. Griffith also comes out ahead in sheer spectacle, but Dreyer is the front-runner in making all four segments have the emotional impact that Griffith only able to conjure in the Babylonian and modern segments of his film. The thematic material is also somewhat similar, though Dreyer's version is rather more coherent, especially in its explicit focus on betrayal. The Dantean notion that betrayal is the worst sin, reserved for the lowest circle of the Inferno, finds a voice here as Satan sets into motion four separate betrayals, with differing motivations and a variety of consequences (though seldom anything resembling a happy result). Rather than interweaving the stories as Griffith had, Dreyer tells each one at a time, which allows for more economical storytelling but lacks something in the narrative urge of which Griffith was a master. Dreyer's talents are most evident in his use of the camera. As would be the case in The Passion of Joan of Arc a few years later, the closeup is given heavy usage here. Most prominent are the frequent direct profiles of characters against a black background, giving them a disembodied feeling almost like onscreen cameo jewelry. He generally has his actors using very naturalistic techniques (though Tappidan as Siri occasionally lets loose with the overbearing melodrama), making the film feel much more modern than many later films of the silent era. This, combined with the frequent closeups, pulls the audience inexorably into the stories, even though they are a bit labored and instructional-feeling as scripted. The theology of the picture is intriguing; surely the Catholic Church cannot have smiled on the idea of its Inquisitors being none other than Satan himself. Dreyer's interest in the biblical segment is tightly focused on the betrayal itself; he dispenses with the rest of the familiar story, which makes its conclusion feel a bit abrupt but also keeps the piece from meandering as it does in Griffith's version. The relationship of God and Satan is perhaps the most interesting part of the film, with God demanding that Satan continue his evil ways, adding 100 years of torment for each soul corrupted by Satan and removing 1000 years for each soul able to resist temptation. This is surely the betting God of the book of Job, quite uninterested in the affairs of men except as a plaything, in the mold of the Greek and Roman gods. Satan, on the other hand, desires nothing more than to get back into God's good graces and even expresses the wish that more people would be able to resist his wiles. This is a most unusual interpretation of Old Scratch, but a thoughtful one that raises any number of questions. Religion is never easy in Dreyer's films, and this early picture is no exception. Image Transfer Review: The original full frame picture is quite satisfactory for the most part. The principal problem is the whites tend to bloom and get blown out. That could be intentional in the Jesus segments, but it also occurs with such random objects as a cockatoo, making that explanation quite unsatisfactory. The picture is otherwise crisp, with a decent greyscale and the contrasts are not otherwise overwhelming. Image quality varies from shot to shot as anywhere from crisp and detailed to soft and dupey. Intertitles are modern English replacements in plain unornamented text that's fairly ugly. There's the expected wear for a film that's 85 years old, with scratches, nicks, dings and the accumulated detritus of the decades throughout. Audio Transfer Review: Philip Carli contributes a piano score to the film that's generally quite appropriate. The only complaint is that it frequently calls for so much accenting that the emphasis gets completely lost. Less would have been more. It's fairly bright but a solid modern recording without noise or hiss. Extras Review: There are no extras whatsoever. Chaptering is reasonably thorough. A compelling examination of betrayal through the ages, made into something more by Dreyer's emerging techniques. The transfer is quite good, but there are no extras.